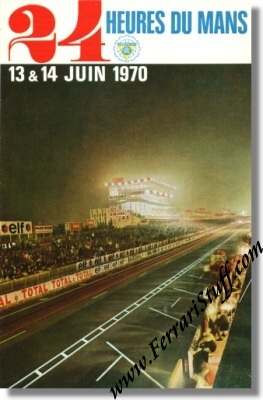 Vintage 1970 Le Mans Race Handbill. The race was won by Richard Attwood & Hans Herrmann in their Porsche 917K (S/N 023) with a total of 343 laps to their name. For the full results of this race, please see 24 Heures du Mans results 1970. It measures 5.4 x 8.4 inches and unfolds to 21.6 x 8.4 inches.